In what ways have contemporary American poets and artists responded to notions of place challenged by a high-tech era where “place” is often a virtual, undefinable one? How do poets and artists respond to a world where spatial and temporal boundaries are altered? How do artists redefine this sense of reality? 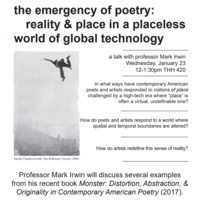 Professor Mark Irwin will discuss several examples from his recent book Monster: Distortion, Abstraction, & Originality in Contemporary American Poetry (2017).